For corporations and startups alike, achieving success and growth depends on a support network and ecosystem in which to collaborate. In this article, we explore eight different innovation hubs and how they help support both new enterprises and innovation-minded corporations. New York City’s technology ecosystem, sometimes called “Silicon Alley,” is hosting a variety of different industries and technologies, spanning from education tech, health tech, and financial tech. However, most prominently, New York City has been leading in blockchain. According to Forbes, New York City has the most job postings within blockchain, with 1,316 job openings in 2018, more than double the next follower, San Francisco. New York’s status as a financial hub has created a powerful ecosystem for blockchain innovation. Also contributing to New York’s status as a top innovation hub is the city’s position as the leading Internet hub and telecommunications center in North America, including its vicinity to many transatlantic fiber-optic trunk lines, the city's intellectual capital, and its extensive outdoor wireless connectivity. The Bay Area is home to countless high-growth companies, including Apple, Facebook, Google, Uber, and Salesforce, which has created a dense startup ecosystem supported by a strong talent pool. The region filed more patents per person (34,324 international patents between 2011 and 2015, with Google accounting for 6.5% of all applications) than any other city. Between 35% and 40% of all venture funding in the US flows into the Bay Area every year, according to a 2012 study by the Bay Area Council Economic Institute and Booz & Company. Despite the London tech community's vocal opposition for leaving the European Union, 2017 was a record year for venture capital in the city, with tech firms raising a record £2.45 billion and accounting for around 80% of all UK venture capital tech funding in 2017. Over 50% of this capital was in FinTech. London has made no secret of its goal to become the FinTech capital of the world by 2020. Thus, it should come as no surprise that the UK government offers some of the best incentives around for growing technology companies. The UK's main financial regulator, the Financial Conduct Authority (FCA), has committed to streamlining the regulatory process for FinTech startups, thus reducing the need for expensive legal advice or hiring financial service consultants. The FCA's Innovation Hub staff also provides qualifying startups with regulatory legal advice, which can save thousands in legal expenses; something startups would be unlikely to find anywhere in the European Union. Tel Aviv is leading the way in cybersecurity, with a growing, high-density startup ecosystem. Tel Aviv has only about 435,000 inhabitants, but over 2,500 startups, giving it one of the highest startup densities in the world. Adding to the growth of the Tel Aviv startup ecosystem as an innovation hub is the Israeli military system. The army invests large amounts of money into military research and development. This results in highly trained and qualified IT-experts, especially within cybersecurity and information technologies. Many of those highly trained individuals have gone on to start high-tech startups within these fields in Israel. 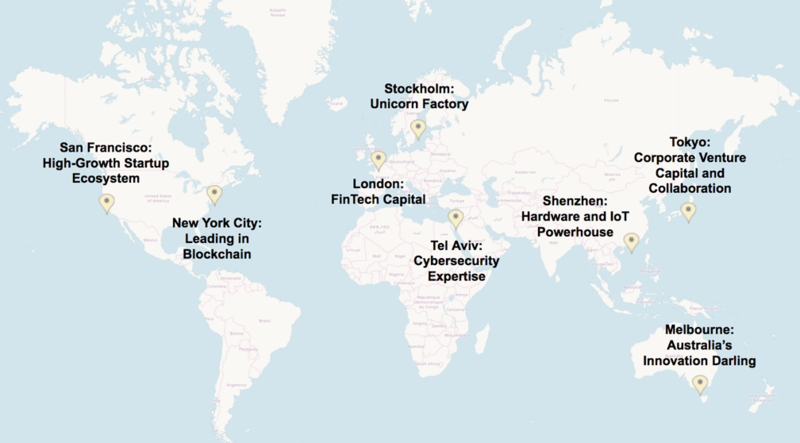 Tel Aviv’s efforts in cybersecurity have created over 300 cybersecurity startups, has exported $6.5 billion in cybersecurity products in 2016, and has collaborated with over 30 multinational corporations to open R&D centers in the city. Melbourne is considered the top tech hub of Australia and has continued to grow as a global innovation hub. Last year, the city released its four-year Startup Action Plan. The plan recommends the City of Melbourne work with startups to connect them with industry so they can commercialize intellectual property, and it uses the city’s international connections to help startups go global. It also outlines how the State Government can work with developers to create affordable spaces for startups. In the region, there has also been tremendous growth in accelerators and co-working spaces, supported by the Startup Action Plan. Over the past few years, there has been a 600% increase in accelerators and 900% increase in co-working spaces. As a result of this growth, there is one accelerator for every 41 tech startups in the region, and 15 coworking spaces for every 100 tech startups. Tokyo has a rapidly growing startup scene, driven by a collaboration of corporations and startups. Traditional Japanese corporations have been said to be slow-moving and risk-averse, though they are increasingly turning their attention and dollars to more nimble, faster-moving startups in order to innovate more quickly. Major corporations in Japan are supporting the growing startup scene, with 25 of the 44 companies ranked in Forbes Top 500 engaging with startups in one way or another. This engagement is increasingly characterized by corporate venture capital invested into new enterprises. Japanese giants, such as Toyota Motor and Panasonic, are increasing investment in startups, pouring 27 times as much money in 2017 as five years before. Venture capital investments by major Japanese corporations (specifically through corporate venture capital and corporate funds) totaled 172 deals in 2017, the highest number on record. These investments began growing in number in 2011 and reached a record 68.1 billion yen ($611 million) in 2017. In addition to corporate venture capital, corporations are coming together to create funds that support new technologies. For example, Cyberdyne (developer of the robot suit Hal), has partnered with Daiwa House Industry, Sompo Japan Nipponkoa, Daido Life Insurance, Mizuho Bank and its venture capital unit Mizuho Capital to create a fund to support tech-specialist startups. The fund seeks to raise 20 to 30 billion yen in total. Stockholm, second only to Silicon Valley, has produced the most unicorns (companies valued at over $1 billion), per capita. It's also the second highest ranking city for the fast-growing companies, according to the 2017 Inc. 5000 Europe. Notable unicorns in Stockholm include Spotify, Klarna, King, Skype, and Mojang. In 2017, there were nearly twice the amount of venture capital invested into Swedish startups compared to 2016, if you exclude Spotify’s gigantic $1 billion in debt financing last year. Several factors contribute to Sweden’s high-growth startup ecosystem, such as government-provided healthcare that enables entrepreneurs to take risks in new ventures without worrying about insurance. Additionally, all students in high school are offered six-month entrepreneurship programs. University is also free to all students, including graduate school. The Swedish Startup Manifesto outlines how the country can best support the startup ecosystem. This combination of factors provides support to budding entrepreneurs. Shenzhen is a center for hardware manufacturing, including advanced electronics and IoT applications, which has developed its own international competitive innovation ecosystem, attracting both startups and corporations. Tencent, internet powerhouse, is based in the city, as well as other global players in the hardware space including Huawei and ZTE. Because of this, the city sees the second highest number of patent applications of any city in the world. Also supporting Shenzhen's growth in hardware innovation is China’s appetite for new products - the country’s huge population base combined with a fast-growing wealthy upper class results in a segment that is very eager to test new consumables, wearables, and devices. Additionally, the cost to manufacture in China is low, making the cost of goods sold affordable. Shenzhen has invested more than 4% of its GDP annually in research and development (R&D) since 2013, setting it as equal to South Korea and Israel, two countries that hold the world’s top slots as far of investment in R&D, according to the OECD. In 2017, the Shenzhen government planned to budget ¥80 billion for supporting new technology innovation. For corporations and startups alike, location can be an important factor in strategic growth. Finding the right innovation hub is all about becoming part of an ecosystem and collaborating with others in the industry. RocketSpace offers access to leading tech ecosystems in San Francisco and London. We connect startups to major corporate partners and investors, and we connect corporations to disruptive startups. Check out our tech campuses to see how you can become a part of a major innovation hub.